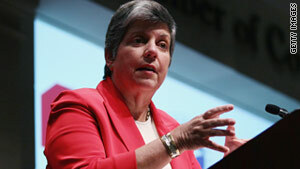 Homeland Security Secretary Janet Napolitano said she expects funding for the department to begin to level off. Washington (CNN) -- Intelligence officials have picked up "lots of chatter" on jihadi websites and elsewhere about the impending 10th anniversary of the September 11 terrorist attacks, but nothing yet that warrants issuing a threat advisory, Homeland Security Secretary Janet Napolitano said Thursday. Nonetheless, the department will be at a heightened level of readiness as the nation commemorates the anniversary, "staffing up" federal air marshals and other agencies. "We don't have something that would reach that standard (of a credible threat), but we still have lots of chatter out there. And we take every bit of that seriously and are tracking it down," Napolitano said. "In the intel world, there's lots of chatter, and we're taking it all seriously. And should there be something that rises to the level where I have to issue a threat advisory, we will issue a threat advisory." Napolitano said it is not uncommon to see increased chatter before major events. "We know it's an iconic day to al Qaeda, in part because of what was found at the (Osama bin Laden) compound. So we are preparing accordingly," she said. "I don't want to give those (details) out because I don't want to tell the bad guys exactly what we're doing," Napolitano said. "But I think it's fair to say that in addition to asking citizens to be vigilant and so forth, that we have ourselves leaned forward and have made sure that we are doing all that we can from the DHS perspective." The Homeland Security chief's comments came in response to questions at a briefing with reporters in Washington. Asked about congressional efforts to address the national debt, Napolitano said it is likely the DHS budget, which has grown from about $39 billion in fiscal year 2004 to about $55 billion this year, will level off. "With respect to DHS, yes, I expect that we will flatten out, and that's not surprising. I mean at the beginning of a department, of course you're going to be putting more and more money in until you get things kind of established and set up. There are things we'd like to do that are going to have to be postponed. St. Elizabeth's is a good example. That's supposed to be our headquarters. We will have to postpone that," Napolitano said. "But the direction I gave the department ... is that we should have no deleterious impact on frontline personnel. We have got to be able to protect our borders, protect our coastline. We've got to be able to enforce our immigration laws. We've got to be able to take the intel that comes around the federal level and get it into local hands and prevent, to the extent we can, terrorist acts from occurring, and we've got to have the ability within FEMA to prepare for and respond to natural disasters. ... That's our guiding light." Grants to state and local governments "now need to focus on not buying new stuff, but maintaining what we have," Napolitano said. She also said training exercises and drills should focus on "scenarios that are something that could occur," with quick feedback. "I think overall, the spending has been deployed in a way that does make us safer and more resilient." Asked about calls by some Republican presidential candidates to dismantle the Transportation Security Administration and the Federal Emergency Management Agency, Napolitano said she did not want to get involved in the debate. "I think that in its eighth year now, the Department of Homeland Security continues to improve. ... We have clear direction, clear vision on where we are going. ... I think that (former secretaries Tom) Ridge and (Michael) Chertoff did yeoman's work in getting the department up off its feet ... and I think that it has really begun to gel in important ways." "FEMA has been extraordinarily busy, as you know, really since early spring, when we began to see record tornadoes in the South and in the Midwest, accompanied by record flooding in the Mississippi. ... I think that as the governors who have been working with FEMA have been saying uniformly, it's a very different FEMA than it was five or six years ago." Asked about reports this week that looters in Libya have stolen stockpiles of shoulder-fired missiles, capable of destroying commercial aircraft, Napolitano said the threat has not been raised to her. "If it becomes a risk, it will be raised to me. And as of today, it has not been raised to me. That doesn't mean that tomorrow it won't be raised to me. But as of today, it has not been raised to me." Damage from Hurricane Irene is estimated at $1.5 billion, Napolitano said. That is draining FEMA's disaster relief fund, which was down to roughly "half a billion dollars" over the weekend. DHS is now talking to the White House about whether it should seek a budget supplement or roll costs into the fiscal 2012 budget, Napolitano said. Complicating matters are two other storms approaching the United States that could cause more damage, she said. "That makes it impossible to really pin down a number," she said.